We set the engagement portraits at Rittenhouse Square, then started planning out where exactly we were going to go. Ashley suggested the high rise, so we decided to save that for last. We started on the street-level for some more traditional engagement portraits in Rittenhouse Square itself. We just wandered through the square and the surrounding streets, trying to include as much of the city as possible. Ashley used some of the connections she'd made professionally to gain access to the building so we figured we would be quick! We were able to get some pretty unique engagement portraits high above Rittenhouse in our opinion! 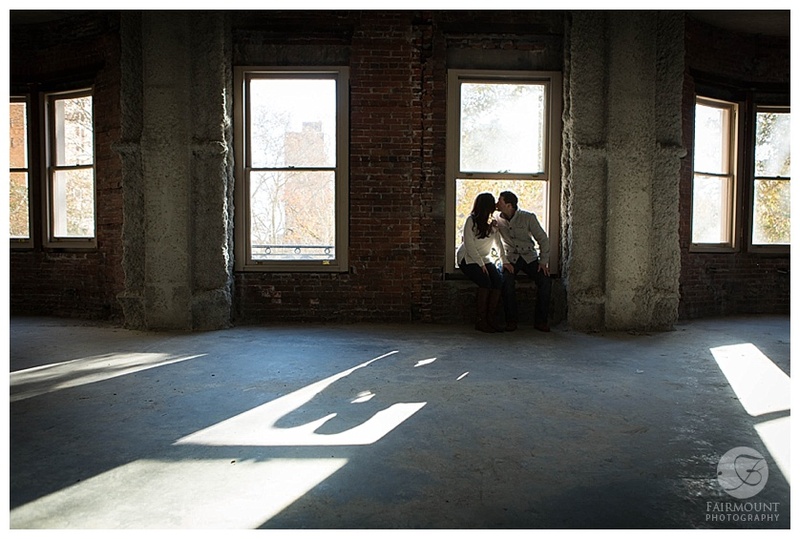 The space had a bare interior because it was getting redesigned so that lent itself well to more industrial-looking engagement portraits. Then, the balcony! One of the best features was a beautiful outdoor balcony that overlooks Rittenhouse Square, allowing us to capture the square from high above. It was pretty breathtaking! It was really a great time, with a mix of traditional locations and personal touches to make the session truly unique. It's exactly what we were talking about in this previous posts about the benefits of engagement portraits!